The 'Wild Flower' is a completely redecorated and updated cozy cottage overlooking Seneca Lake- and exceptionally clean. While not water front, it is about 100yds from the water on a very scenic acre beside our 200 yr old historic mansion. Public lake access is within walking distance. Includes year around sun porch - great when it rains or gets cold. Limo service to wineries, in-cottage massages, bike and boat rentals available. The Outlet hiking/biking trail is walking distance. Located on the Seneca Lake Wine Trail - we consistently receive 5-star reviews and are rated highest for accommodations in this area - recipient of Award for Excellence every year. FYI - BECAUSE HOMEAWAY'S CANCELLATION POLICY DOES NOT ALIGN WITH OURS, WE WANT TO ADVISE YOU THAT CANCELLATION IS BY 1 MONTH PRIOR TO YOUR ARRIVAL DATE. CANCEL BY THEN AND RECEIVE A FULL REFUND, LESS A $50 CANCEL FEE. AFTER THAT DATE THERE ARE NO REFUNDS FOR ANY REASON. SO OUR POLICY IS ACTUALLY LESS STRICT THAN HOMEAWAY'S. ANY QUESTIONS PLEASE TEXT US AT 540-454-1933. Rooms are exceptionally clean and are odor free. Those with allergies will feel little or no discomfort. Linens subject to several stages of cleaning not found in most hotels, motels, or B & B's. Rentals of bikes, canoes, kayaks, and boats available at very reasonable rates. Walking distance to Outlet hiking and biking trail between Seneca Lake and Keuka Lake - 6 miles long. Two tennis courts walking distance. On site massages available - limo service also available. Plenty of parking for boat and car trailers. We are on an acre overlooking Seneca Lake - not lake front. Lake access in short walking distance [100yds]. Our guests enjoy privacy, quiet and solitude. Large peaceful picnic area with plenty of tables and chairs - fire pit [wood available nearby - $5/bundle]. Ideal for couples or small families looking for a quality place to stay at a reasonable cost. Can be combined with cottage in front which sleeps 6. Inquire for combined rate. THE COTTAGE HAS A RELAXING VIBE,WE COOKED OUT, RAN W OUR DOGS, THE HOT TUB WAS SOO REJUVENATING, AND MY TEENAGERS LOVED THE OLD MANSION ON THE GROUNDS, BEDS WERE REALLY COMFORTABLEDEFINITELY RECOMMENDED, FOR FAMILY OR COUPLE!!!!! Wild Flower Cottage was the perfect place for a winter weekend getaway. The hot tub was great despite the cold, and we were warm and cozy indoors when it snowed! The owners were kind and very responsive which was very helpful upon arrival/departrure. And having our pup with us was an added treat! If you are looking for a quaint and cozy cottage this is the perfect place! Clean, quiet, and close to everything. The cabin is well kept and clean. A full kitchen, dishes and flatware, Wi-Fi, Jacuzzi, and a selection of good books make the cabin a comfortable place to spend time. For days when you want to get out, it is close to the Keuka trail, Kashong reserve, Seneca Lake, several wineries, and restaurants, Geneva and Penn Yan. Being able to have our dogs with us was also wonderful. Great weekend even if Curveball was cancelled! Perfect little getaway. Private and clean, close to the lake. I've stayed in this place 2x before and other properties which Pat and Brenda own, they are the best! 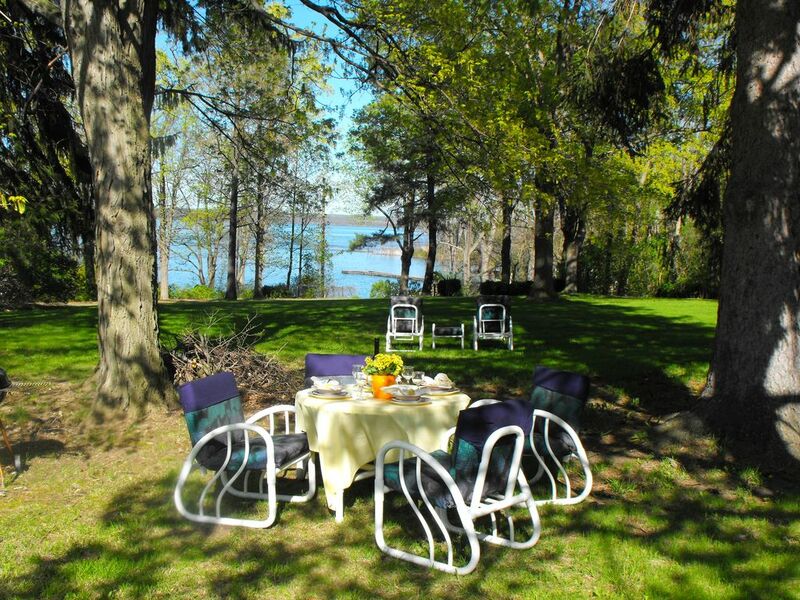 If you are looking for a nice weekend at seneca lake, look up the Savannah House and see what they have to offer! This place has good and bad points. Some good points are location and property size. Easy access to all the good stuff on the lakes. Property is nicely sized and fairly private. I appreciated that it is dog friendly, although the extra charge for the dog adds up after a couple days. The bad points kind of offset the good points. As others have pointed out this is a trailer and a dated one. I couldn't tell that from the pictures. The air conditioner in the master is very noisy and obtrusive as it is a floor unit that vents through the window. Luckily only my wife and I came and didn't need to use the second bedroom. There is an access to the water heater that is open to that mechanical room with no door. And the water heater is a small one. Plenty of hot water for the first person showering (luckily again it was my wife) but not for the second person. If we had booked this for more than a couple of days the annoyances would have been too much to tolerate. I haven't had much luck with bookings at the finger lakes. First time we booked at what looked like a nice B&B and ended up being put in what they called "the cottage", which turned out to be a converted garage. This time "the cottage" turned out to be a trailer. Guess I am going to have to look a little closer next time because we will be back to the finger lakes. This cottage is located just steps from Seneca Lake - 15 miles north of Watkins Glen, and 20 minute south of Geneva - within 10 minutes of 12 wineries - two wineries within walking distance, and within 30 minutes of 50 wineries.